In June 2017, London’s QEII Centre welcomed the Royal National Institute of Blind People (RNIB) for its annual Vision UK conference. With many of the attendees blind or partially-sighted themselves, accessibility was top of the agenda for the event organisers and QEII’s digital services team. 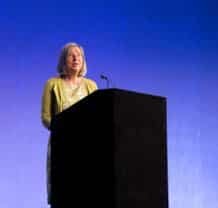 The Shaping Futures conference aimed to inspire action, collaboration and creative thinking to deal with the changing social, economic and political environments the eye health and sight loss sectors operate in. The RNIB needed a central London venue with space for multiple streams and breakouts, first class catering, excellent customers service and above all accessible facilities for all delegates. One of the key requirements of the organisers was to make all event materials accessible to blind and partially sighted delegates, including the full event programme and supporting documents. 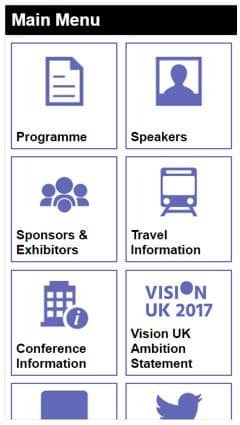 Vision UK 2017: Shaping Futures addressed the important issues facing the eye health and sight loss sectors through a series of talks, case studies and panel discussions, with examples of how other collaborative initiatives are leading the way. QEII’s flagship conference room The Churchill, located on the ground floor, was used for the plenary sessions of the event. The morning streams took place on the fourth floor, in the Westminster, St James and Rutherford/Moore rooms, and a networking lunch and exhibition took place in the first floor Pickwick room. The RNIB worked closely with QEII’s digital services team prior to the event, and creative manager Kevin Etchells was tasked with creating a bespoke app for the event. The app aimed to make all event content available on mobile, tablet, laptop and desktop in an accessible format that worked with a screen reader for blind and partially sighted attendees. A deliberately simple, clean and clear design made the app easy to use, and rigorous testing was carried out prior to the conference taking place to ensure it would be fit for purpose. 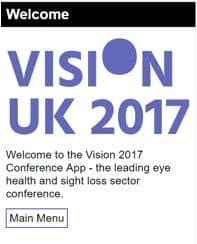 More than 300 delegates attended the Vision UK 2017: Shaping Futures conference at the QEII Centre, with a full day of plenary sessions, individual streams and case study presentations sparking discussions of how the eye health and sight loss sectors can collaborate and innovate going forwards. The bespoke app, created by QEII’s in-house digital services team, was a great success. The app was used by 128 of the attendees at the conference, and proved particularly useful for making materials available that were supplied only days before the event. To have produced these in an accessible print format with such a short turnaround would have been difficult but the app provided a simple solution and made all of the information easily available to delegates. For the QEII Centre, the event was a fantastic opportunity to showcase the skills and services available in-house at the centre. More and more frequently, event planners are looking to venues for a turnkey solution to all their event needs, including digital and creative support with bespoke assets such as backdrops, branding, logos and signage. QEII’s ability to provide such services to the RNIB, including the creation of the bespoke app, made the event planning process far smoother for the organisers, giving them one point of contact rather than liaising with numerous external suppliers. The organisers of the event were pleased with the overall execution of the conference and with how well the app worked.